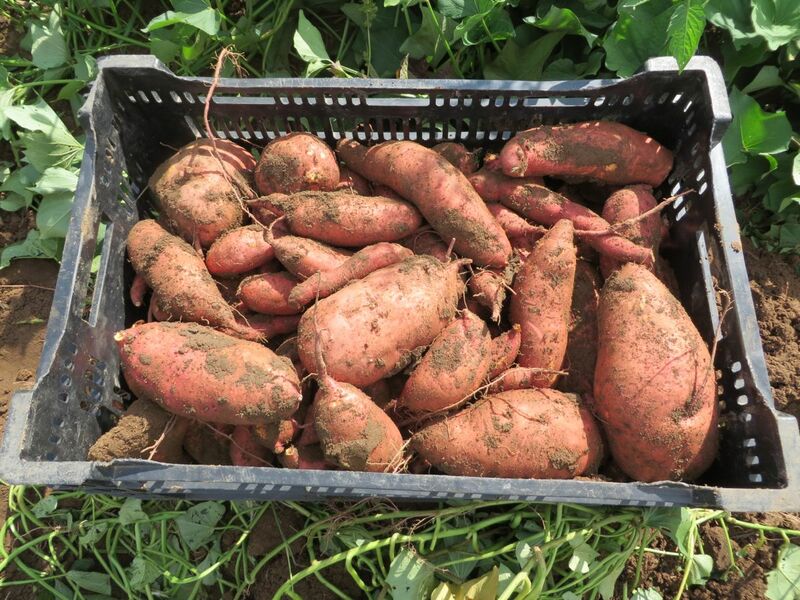 Sweet potatoes pop out of the ground when the soil is just right – not too dry, not too wet. From top, Steve mows the vines and undercuts the roots to bring them to the surface. We pick them up by hand. They need to be handled very gently at this stage. At bottom, Jeremy finds a favorite. Billy tosses cabbage to Kyle. Maggie and team sort winter squash as it comes up the conveyor belt. We will pack several types of winter squash this week, although each member will receive just one type. We tried a few new varieties this year, and are sharing ones that passed our taste tests. 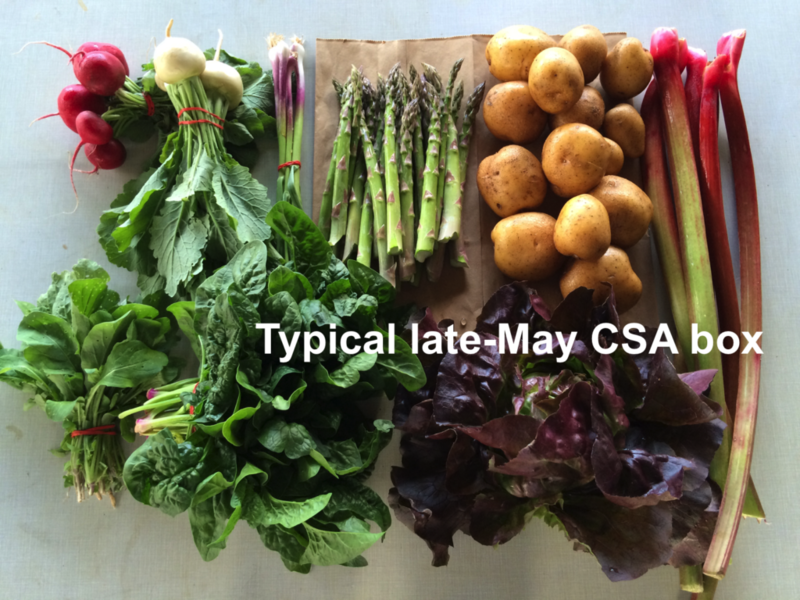 Some new varieties are great but others are duds. We only send the good ones. If you have a strong opinion about the squash you receive this week (good or bad), could you let us know? We’ll keep track of where the varieties are delivered. Clockwise from top right, Sugar Dumpling (2), TipTop acorn, sweet dumpling (2), and Honey Boat delicata. The early winter squashes were not very productive because of pest problems. On the other hand, the butternuts did great. Above, keeping the butternut squash warm and dry in the greenhouse so they cure and sweeten. Next week’s box will probably contain cauliflower OR Romanesco broccoli, winter squash, cabbage, leeks, carrots and more. Peppers! – It’s a pepper medley this week. We are stripping the plants in anticipation of frost in a few days. It is so hard to let the pepper season end. We’ll protect a few varieties with floating row cover so we have peppers for you next week. – The classic use; pan fried with ones and garlic, then used to top sausages. – Grilled or roasted, then served atop cheesy polenta. – I keep a few roasted peppers in the fridge, to top pizza or salads, or dress up grilled cheese sandwiches. They are handy to dress up simple pasta dishes. – Roasted then pureed with grilled or sautéed onions and garlic to make a chunky spread for bread. Zavory “mild” habanero chiles (small; red, orange or green) – Well, these chiles have gotten hotter than the last time we delivered them. Not sure why. They are still pretty mild, about the same as an Anaheim, with lots of interesting flavor. At left, sweet frying peppers. At right, mildly hot Zavory habaneros.